So far, there have been no Flash-based web tools available for chemical structure input. The authors herein present a feasibility study, aiming at the development of a compact and easy-to-use 2D structure editor, using Adobe's Flash technology and its programming language, ActionScript. 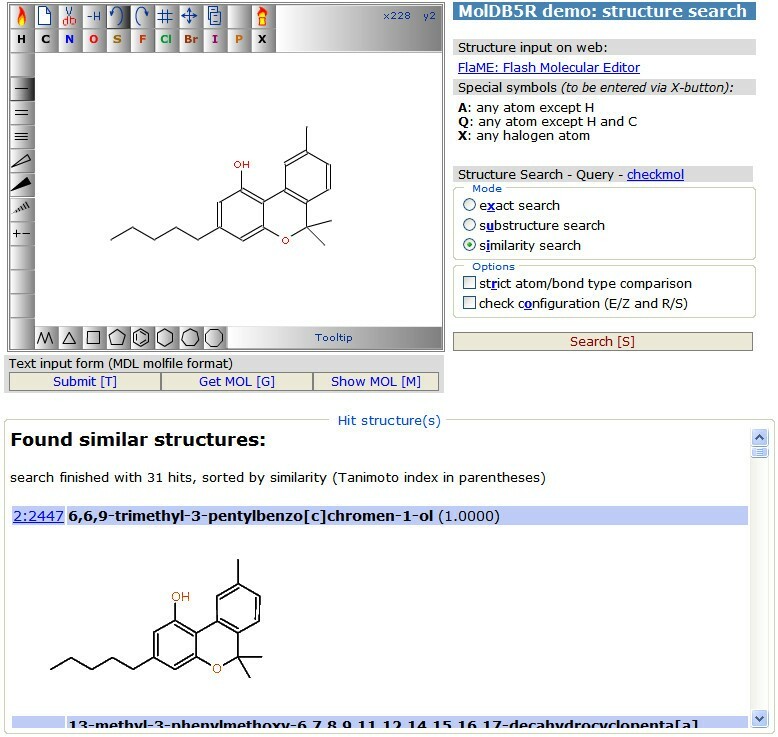 As a reference model application from the Java world, we selected the Java Molecular Editor (JME). 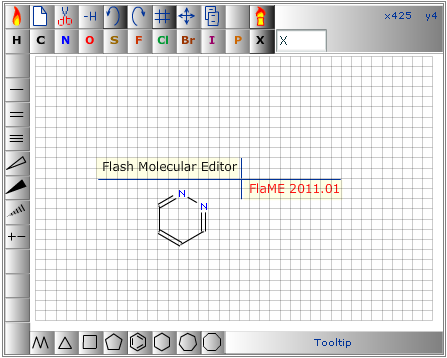 In this feasibility study, we made an attempt to realize a subset of JME's functionality in the Flash Molecular Editor (FlaME) utility. These basic capabilities are: structure input, editing and depiction of single molecules, data import and export in molfile format. At present, there are various tools available for structure input on web pages, for example Marvin Sketch , PubChem Sketcher , NIST Molecule Editor  or JME . The latter one is very popular because of its compact footprint and intuitive use. It has been utilized by many web developers (including the authors of this article) for sites with chemical content. Recently, a comprehensive review article  summarized the developments in this field. Prompted by the statement that so far no Flash-based web tool for structure input is available, we decided to undertake a feasibility study, aiming at the development of a compact and easy-to-use 2D structure editor, using Adobe's Flash technology and its programming language, ActionScript. As a reference model application from the Java world, we selected the Java Molecular Editor (JME). In this feasibility study, we made an attempt to realize a subset of JME's functionality in the FlaME utility (part I, this article). These basic capabilities are: structure input, editing and depiction of single molecules, data import and export in molfile format. As this is just the beginning of the project, we intend to continue and extend this work with additional features like reaction editing and the implementation of other data exchange formats (e.g., SMILES) (part II, in planning). As mentioned above, the authors were inspired by the JME applet written by P. Ertl  when designing the layout of the graphical user interface (GUI). Nevertheless, we tried to create a typical and unique look-and-feel for our new tool (Figure 1). Actually, there should be no explanation needed for a novice user of FlaME. Users should immediately feel familiar with the buttons and functions in FlaME. Furthermore, tooltips are displayed in the right bottom area of the GUI which are activated by slowly moving the mouse pointer over the various buttons, thus facilitating use of the applet. The FlaME GUI is simple and all icons on the buttons should be intuitively understood. 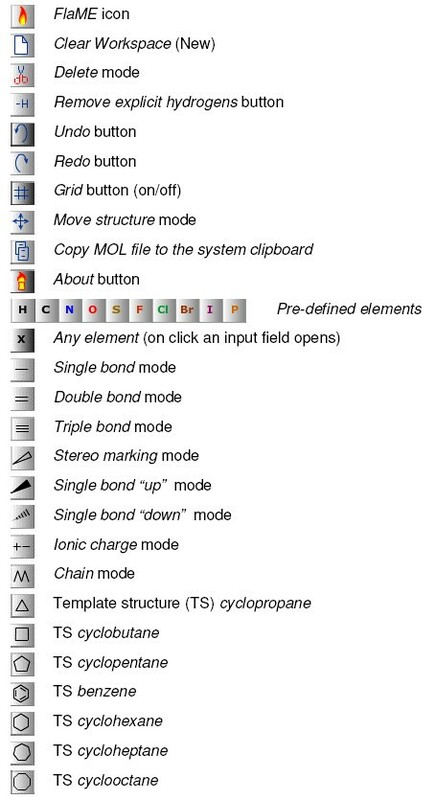 Figure 2 shows the icons and a description of the individual buttons. Description of the GUI buttons. The element or group label will change automatically depending on element and current environment of the particular structure node (node environment). While the purpose of the getMol() function could be described as "export as MOL file", the setMol() function could be called "import MOL file" and it can be used for structure input in textual form for further structural modification using FlaME (see example 1). The actions of FlaME implemented so far do not reflect all of the basic primitives for molecular diagram sketching, described previously . It was not the purpose of this tool to cover all these possible functionalities, but to provide users (and developers) with an opportunity to use a rather compact input tool for chemistry-related websites. The standard template structures included in FlaME are: cyclopropane, cyclobutane, cyclopentane, cyclohexane, benzene, cycloheptane, and cyclooctane. Once placed in the drawing area, these structures can be edited by changing the bond order (single, double and triple), by changing the atom type (element), or by changing the stereo style (stereo marking). The Shift key on the computer keyboard can be used to modify some of the drawing operations of FlaME: whereas ring fusion (annulation) by clicking with a ring template on an existing ring bond normally produces a fully expanded condensed system, pressing the Shift key while clicking will cause the new ring to be flipped to the opposite direction (Figure 3, structure a). Similarly, adding a ring template to an existing ring atom normally produces two rings connected by a single bond, whereas the Shift key modifies this behavior and leads to a spiro ring system (Figure 3, structure b). Furthermore, by pressing the Shift key the user can prevent the delete operation from removing terminal ("orphan") atoms when a bond is deleted (Figure 3, structure c). The latter option can be used to create disconnected structures (e.g., salts) from a single molecule, thus providing a work-around for the current limitation of FlaME to handle only a single connection table. Using the Shift key while editing a molecular structure. Compared to the JME applet, FlaME still lacks a number of features which may be implemented in future versions. For instance, there is currently support for only one connection table at a time. Thus, there is no mode available for reaction input and depiction. Special definitions for query atoms are limited to A, Q, and X (see below), while R groups are not yet supported. Moreover, at present the only data exchange format is the MDL molfile format (V2000), whereas SMILES export is still on the to-do list. FlaME is a single-file Flash application. It was written in ActionScript (AS2) and compiled as a Flash 8 SWF file. Thus, this application requires a common web browser (Firefox, IE, Opera, Chrome, Safari etc.) and the Flash Player plug-in at least in version 8. According to Adobe: "Today, over 86% of Internet-connected computers have adopted the Flash Player version 9" . Whereas there should be no principal (technical) problem to make use of an Adobe Flash Player also on Apple's mobile devices (iPhone, iPad and iPod touch), Apple has decided not to support Flash on these devices and therefore, applications such as FlaME cannot be used on them. However, essentially the same restriction applies to Java on the iPhone/iPad which also prevents Java-based structure editors from being employed on these mobile devices. Although there are some "inofficial" ways to install unsupported software on Apple's mobile devices, only a change in Apple's policy would lead to a general solution of this Flash/Java lack-of-support issue. It should be noted, however, that FlaME was developed for use on typical desktop computers rather than on mobile gadgets. Because of the inherent limitations of the V2000 MDL molfile format (see the CTfile formats description ) which is used by FlaME for data exchange, the maximum number of atoms is limited to 999. In this section, three application examples are presented which have been built around FlaME and which are freely accessible on the web. A common web development practice is to use both an <object> tag and an <embed> tag to display Flash (SWF) content within an HTML page . The nested-objects method requires a double object definition (the <object> tag targeting older versions of Internet Explorer and the <embed> tag targeting all other browsers), so it is necessary to define the object attributes and nested param elements twice . The required attributes are: classid (the value is always as shown below), type, width, and height. The required param element is movie, which defines once more the URL of a SWF file. For up-to-date web browsers, one specifies the URL of the Flash application with the src attribute. MolDB5R similarity search using FlaME for query input. MolDB5R substructure search using FlaME for query input. Explicit Hydrogens are entered via a separate H button. FlaME demo page in "slide show" mode. 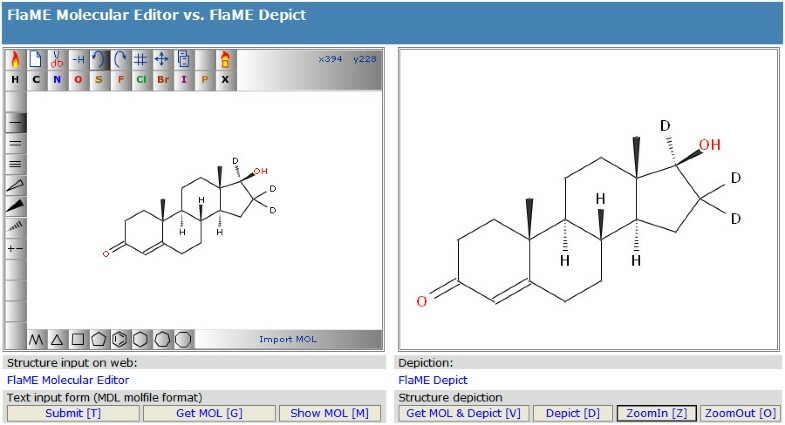 FlaME: Molecular Editor vs. Depiction. This depiction-only version of FlaME was compiled separately without any GUI buttons and layout options. By doing so, the size of the SWF file could be reduced to approximately one third (25 kB) of the original file size of the editor version. 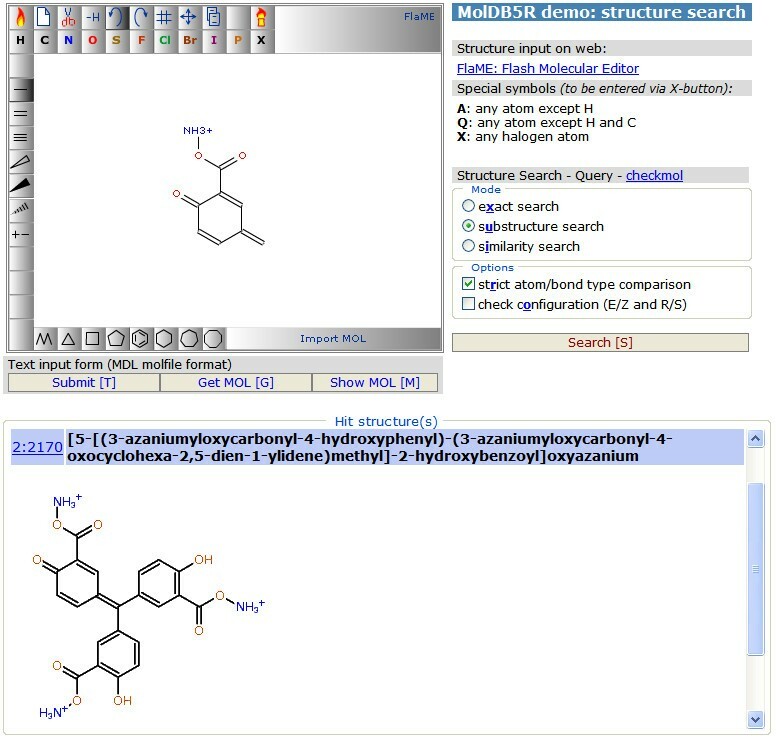 A first attempt was made to create a compact single-file application for 2D molecular structure input/editing on the web, based on Flash technology. At present, the project should be regarded as a feasibility study and any feedback (comments and suggestions for further development and extensions) will be welcome. The next version of FlaME should include a reaction editor and some other extensions, for instance generation of SMILES  output. For future developments, we envisage a separate Flash application for handling spectral data, e.g. for JCAMP-DX spectra viewing/editing. In this field, there are already some nice plug-ins and Java applets available (e.g., MDL Chime , JSpecView Applet , or the NIST JCAMP-DX Viewer ), which could be taken as models for writing a comparable Flash-based tool. Developers of chemistry-enabled websites are invited to try FlaME on their pages. The utility [Additional file 1] can be obtained free of charge from the authors. As the only condition for its use, we ask to place an appropriate reference next to the applet. The authors provide the present version of FlaME only as compiled SWF file, but we are contemplating the possibility to make it an open-source project in the future. We are aware of the fact that the major Flash development tools are not free. For a true open-source project, an open-source development tool such as AJAX Animator  would be desirable. However, at present the latter product is still far away from its goal to be a complete web-based animation suite. License: individual license on request (free of charge). We thank all interested colleagues at our department for helpful discussions during the development and suggestions for further extension of FlaME. PD was involved in the design and programming of the FlaME software, in the implementation of the software and preparation of the application examples, and the manuscript preparation. NH was involved in testing and intellectual guidance during FlaME software development, in preparation of application examples, and manuscript preparation. All authors read and approved the final manuscript.